Recipe for Simple Crab Cakes is a basic crab cake recipe perfect for beginner cooks and a great jumping off point for seasoned chefs. 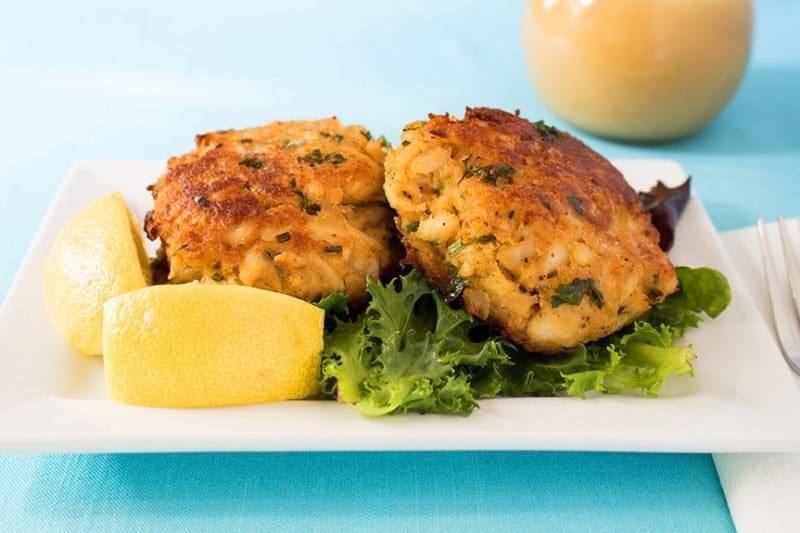 Simple Crab Cakes are great for spreading holiday cheer, ringing in the New Year, as well as serving up a light dinner during summer heat waves. It’s kind of an all-around great dish! Making crab cakes is fairly simple and generates very little kitchen heat. I like to pair this with my $30 salad for a light summer dinner. They can be made with canned crab meat, refrigerated fresh crab meat, or fresh meat from crabs you have steamed yourself. I can’t cook live crabs or lobsters, it’s part of my nature. If you can, the crab meat will be perfect for crab cakes. This crab cake recipe is just a base, feel free to add anything extra you would like bell peppers. I like to add red and green bell peppers whenever I have them on hand. I do not bake mine because I can never seem to be able to get them to hold together when I take them out of the oven. There is also something in my head that says to me they aren’t cooked all the way through without frying. 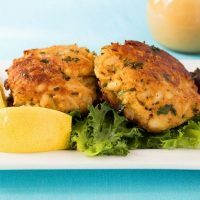 These Simple Crab cakes make a nice addition to a seafood platter when matched up with butterflied fried shrimp, beer boiled shrimp, and crab stuffed mushrooms. Basic crab cake recipe, starts with pasteurized or canned crab meat and is easily adjusted to suit your own tastes. We like bell peppers and onions in ours. 1 teaspoon Old Bay Seasoning (more if you like yours spicier? In a large bowl add mayonnaise, mustard, Worcestershire sauce, Old Bay seasoning, and eggs. Mix together until well combined. Add onions or chives, bell peppers, if using, and parsley, mix until well blended. Add crab and gently mix to combine. Sprinkle bread crumbs over mixture and mix with hands until just combined. Let mixture rest in the refrigerator for at least one hour. Take out of refrigerator and form into small patties for appetizers, or large patties for dinner. Heat a skillet over medium heat and add oil to cover bottom of skillet at least 1/4 of an inch. Add crab cakes to the hot oil and leave until bottoms start to turn medium brown. Very carefully flip crab cakes over and cook until other side is medium brown. Remove from skillet and place on paper towels or a draining rack. Serve with lemons and tartar sauce or your favorite remoulade.